The soul that we are is one with the soul of the Earth. This is the knowledge contained in the three circles, and captured in particular in the Sacred Truth. We are the Earth, each of us. We carry within us the veiled psychic being, a particle and spark of the Manifest Divine. Not only do we envelop this spark but each cell of our body is as well an envelope of the spark, and each atom and sub-atom. Our bodies are the perfect and identical representation of the Supreme because each of our cells is like unto the Supreme's cells, the Galaxies. They each contain the Trinity of the Circles, and all these minute particles spin around and owe their life to the Central Fire in the soul, the psychic being. Embody the energy of Lord Pakal, the child of the Trinity. It is possible for humankind to embody the Energy in a pure way and to become representative of a new humanity, a totally new manifestation. 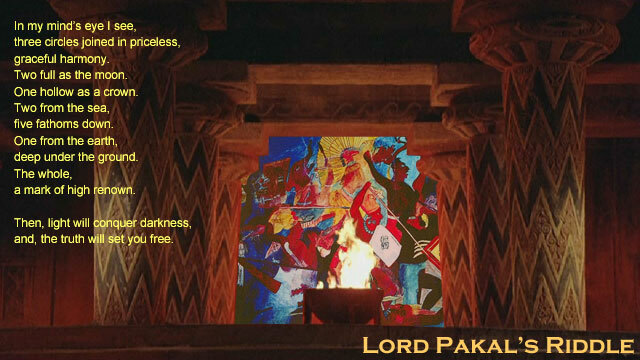 Are you wise enough to solve Lord Pakal's Riddle? Can you think like a Mayan Priest and discover the secrets of our Universe? If so, send your email to Lord Pakal. Your ideas can be posted in the Mayan Oracle.